Archbishop Charles Chaput celebrated the feast day Mass for St. Katharine Drexel on Sunday, March 6, at St. Elizabeth Convent, the motherhouse of the Sisters of the Blessed Sacrament in Bensalem. This year took on special significance because it is the 125th anniversary of the sisters’ congregation, which formally came into being on Feb. 12, 1891, when Katharine Drexel took her vows at the Convent of the Sisters of Mercy in Pittsburgh where she received her religious formation as a postulant and novice. During his homily, Archbishop Chaput took note of an event that had taken place four years earlier, when Katharine, a wealthy young laywoman along with her sisters, Elizabeth and Louise, had an audience with Pope Leo XIII. Katharine asked the pope to send missionary priests to America to work among the Native Americans because very few American priests were in that ministry. It was perhaps fitting at this year’s feast day Mass that the Sisters of the Blessed Sacrament gave their annual St. Katharine Drexel National Justice Award to Father Wayne Paysse, a former executive director of the Black and Indian Mission Office headquartered in Washington, D.C., in a building donated many years ago by St. Katharine Drexel. As a matter of fact in the early years of the annual collection taken up nationwide for Indian and Black missions, St. Katharine’s annual donation exceeded that of the rest of the country. In her introduction of Father Paysse, Sister Donna Breslin, president of the Sisters of the Blessed Sacrament, recounted his life growing up in a devout household, influenced by a devout pastor and ministry in mostly African American parishes and mission work. “All of his assignments prepared him for his assignment at the Black and Indian Mission Office,” she said. Bringing up the gifts at the Mass were Bob Gutherman, whose cure of a life-threating ear infection was the accepted miracle for St. Katharine’s 1988 beatification, and Amy Wall, whose gift of hearing was the accepted miracle for St. Katharine’s 2000 canonization. 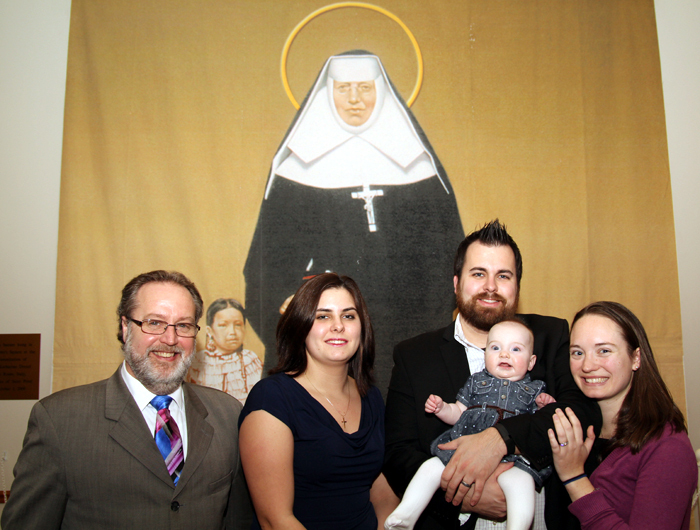 Also at the Mass was Amy’s brother, Jack, along with his wife Christina and infant baby Katharine. It was Jack who persuaded his family to pray to Mother Katharine to intercede for his little sister. “It’s really nice to come back,” said Amy Wall, who will soon graduate from Drexel University on a scholarship given to her at the time of the canonization. Many of those present for the Mass were long-time devotees of St. Katharine. For Trudy Brown that connection goes all the way back to 1892 when the sisters established Holy Providence School on the convent grounds. “Three of my grandparents were among the first students,” said Brown, who noted four generations including herself attended schools taught by the Blessed Sacrament Sisters. Among her most precious possessions are two letters written by St. Katharine herself to Brown’s grandmother. Very clearly St. Katharine Drexel, who neither sought nor desired personal recognition or glory, remains alive in the hearts of many who were touched by her ministry.